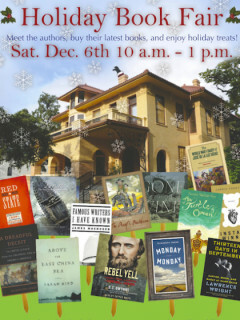 Humanities Texas is hosting its sixth annual Holiday Book Fair at the historic Byrne-Reed House. A number of noteworthy authors will visit with the public and sign copies of their latest books, including Lawrence Wright, Sarah Bird, James Magnuson, Elizabeth Crook, S. C. Gwynne, Naomi Shihab Nye, Bill Wittliff, Carrie Fountain, M. M. McAllen, Jacqueline Jones, Richard Parker, Margaret Lewis Furse, John Taliaferro, Wayne Thorburn, Emilio Zamora, Bethany Hegedus, Chris Tomlinson, James E. Bruseth, Tracy Dahlby and Steve Wilson. Humanities Texas will offer their books at a discounted price. Available titles include works of fiction, non-fiction, and poetry with selections for both adult and youth audiences. Proceeds will benefit Texas libraries.